HARARE – Teachers are headed for a showdown with government this week over deteriorating conditions of service as they plan to down tools on Friday and march in protest. Teachers’ unions told the Daily News yesterday that their members had become fed up with a government they see as unresponsive to their concerns. 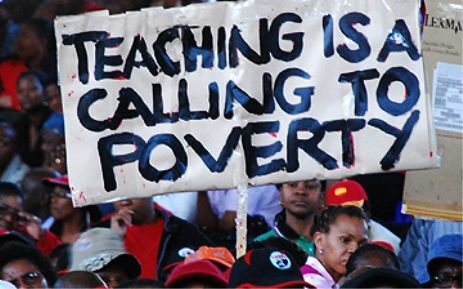 Progressive Teachers’ Union of Zimbabwe (PTUZ) secretary-general Raymond Majongwe told the Daily News yesterday that teachers will down tools on Friday. PTUZ programmes officer Ladislous Zunde said teachers will gather at Africa Unity Square and march to the Psmas offices then to the employer’s offices at the New Government Complex and Mukwati Building to hand in a petition. The country’s educators and other government employees have been demanding that the employer pays their salaries in US$ amid concerns that their earnings have been eroded to worthless levels owing to the plummeting value of bond notes, a surrogate currency introduced by government in 2016. The PTUZ action has been backed by their counterparts stationed at the country’s rural schools; the Amalgamated Rural Teachers’ Union of Zimbabwe (Artuz). This comes after Primary and Secondary Education minister Paul Mavima recently told hundreds of primary school heads in Victoria Falls that government has no capacity to meet the teachers’ pay increment demands presently. This did not go down well with teachers’ unions that felt the minister had jumped the gun as teachers are not employed by his ministry but the Public Service Commission. In its solidarity statement, Artuz called on other unions to join the PTUZ march although they already have been holding weekly protests.